Gardening has become a Mother’s Day tradition around here, thanks to Chicago’s late spring and the let’s-do-what-mommy-wants theme of the day. Even in years where we’ve had obstacles–like an overdue baby or inclement weather–we’ve managed to get a few plants in the ground. This year, it meant planting (and planning) around 8 carpools. Aided by perfect weather, we managed to purchase and finish planting most of our vegetable garden. We are by no means gardening gurus, but we have learned a thing or two over the years. Following are a few tips that have worked for us. And if you have any of your own, send them my way! 1. Start with boxes: We started our garden from scratch, so we built the boxes. This turned out to be easier than tearing out grass and tilling soil, plus we have more control over the soil. Our first box was made of three 8-ft. boards, with one of them cut in half at the store. We screwed them together and set them on top of black landscape fabric. Here are some good instructions. 2. Plant in the sun: I’ve seen beautiful gardens built right under trees. Remember elementary school science? Plants need sun. If you don’t have sun in your backyard, try the side, the front or the roof over your addition. Anything except under a tree. 3. Water and mulch: Plants need water too! Water at least twice a day, preferably not mid-day. This is a great chore for kids, as young as 4. Mulching over the soil once you’ve planted will keep water in and reduce the weeds. 4. Plant some plants: Even though it’s cheaper, we’re never organized enough to start all our plants from seedlings. We start many plants (on Mother’s Day) from plants–tomatoes, peppers, cucumbers and squash. Buy healthy plants from a respectable garden store, like Anton’s in Evanston, Gethsemene in Chicago or Meinkes in Niles. 5. Plant seeds: Many veggies are super easy to grow from seeds and will actually save you money. Beans are easy and fun for kids. Pick them off the vine and eat them right in the yard. Lettuce and carrots are so easy to grow too. 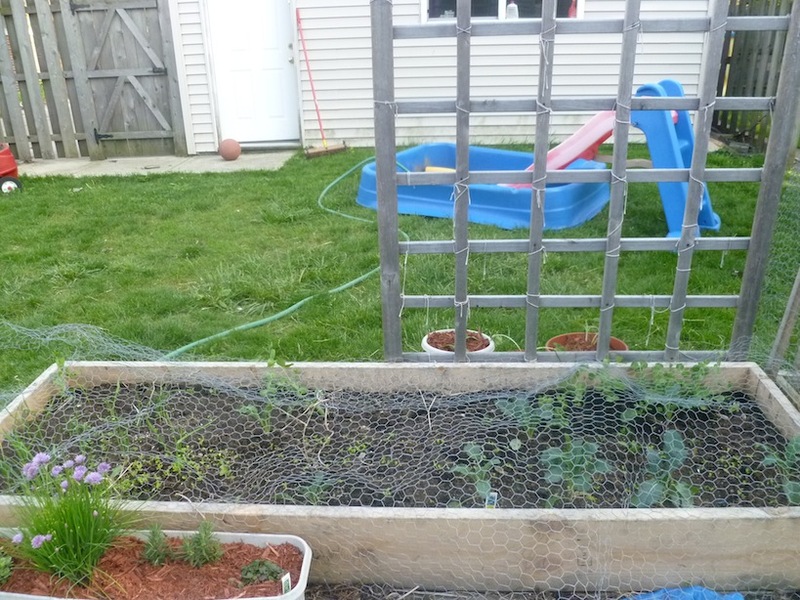 Plant the lettuce and carrots all spring, early summer and fall, every few weeks. 6. Build a fence: We have squirrels galore in our yard, but not in the garden. 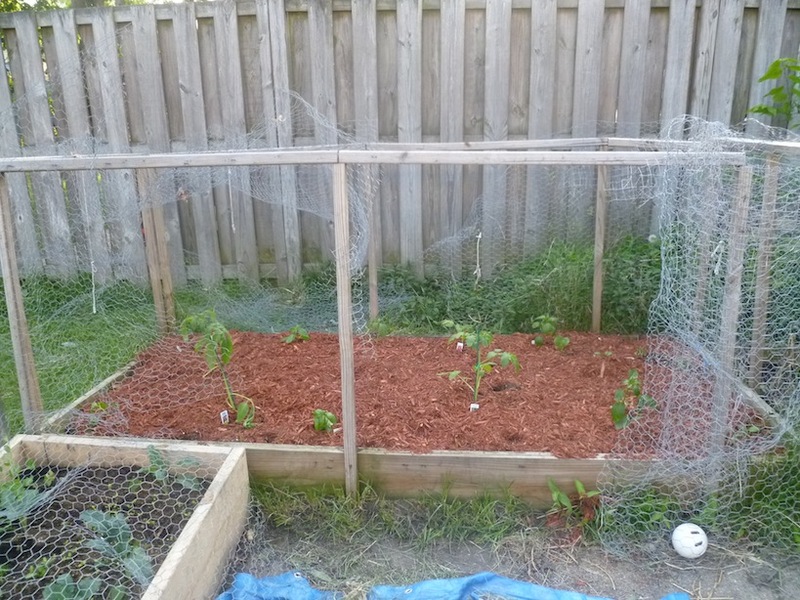 We have a full fence of chicken wire on all sides. “Doors” on two of the sides give us access but keep the animals out.